Climate Adaptation Engineering defines the measures taken to reduce vulnerability and increase the resiliency of built infrastructure. This includes enhancement of design standards, structural strengthening, utilisation of new materials, and changes to inspection and maintenance regimes, etc. 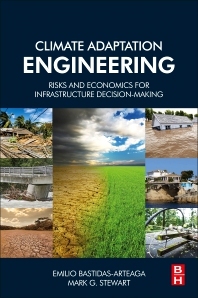 The book examines the known effects and relationships of climate change variables on infrastructure and risk-management policies. Rich with case studies, this resource will enable engineers to develop a long-term, self-sustained assessment capacity and more effective risk-management strategies. The book's authors also take a long-term view, dealing with several aspects of climate change. The text has been written in a style accessible to technical and non-technical readers with a focus on practical decision outcomes. Emilio Bastidas-Arteaga is Associate Professor of Civil and Mechanical Engineering at the University of Nantes in France. Since 2009, he has been working on the assessment of consequences and adaptation of infrastructure and buildings subjected to climate change within the framework of national and international collaborations and research projects. He has been and is also participating in several technical committees related to climate change and civil engineering: French Association for Normalisation (AFNOR, France), American Concrete Institute (ACI, USA), Joint Research Centre (JRC, Europe), and the International Association for Bridge and Structural Engineering (IABSE, International). Mark G. Stewart is Professor of Civil Engineering and Director of the Centre for Infrastructure Performance and Reliability at The University of Newcastle in Australia. He has 30 years of experience in probabilistic risk and vulnerability assessment of infrastructure and security systems that are subject to man-made and natural hazards.